Home » Tech Tips » Windows 10 » How to Change File Permissions in Windows 10? Windows 10 is a powerful operating system that automatically takes care of all the permissions related to files and folders. However, you may encounter file permission problems in many situations. Most of time you will see access denied or file permission error when trying to access the files. 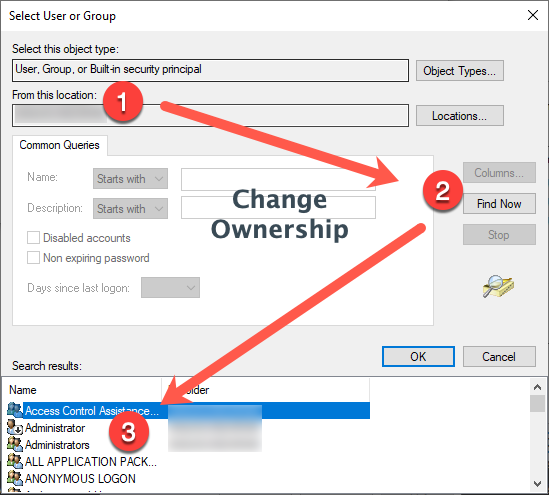 However, if your account has administrative privileges you can change the ownership and permission to access these files. So here in this article, we have laid some steps which you can follow to get the required permissions to access the files and folders. Related: View or hide files in Windows 10. Here are some scenarios you may encounter the file permission error. When you have shared computers and other users setup permission for certain files which you can’t access. You want to access system files. We don’t recommend to edit system files as it may cause unexpected failures. The copied files from USB or external hard drive is protected and you want to modify on your computer. You want to modify files copied from other operating systems like macOS. You want to remove the permission of other user to prevent accessing certain shared files. There are two ways to handle all of the above situations. When you are the owner of the file, simply change the file permission to grant or prevent access of other users. When you want to access other’s files, first you need to take the ownership and then change the file permission. Let us explain both the scenarios in further sections. Remember in both situations you need to have admin access to carry out the required steps. First and the foremost thing which you need to get the permission of specific files is to take its ownership. If you have ownership of that specific file or folders, you can easily tweak the permissions to get access over that files. Follow the below steps to get ownership of any files or folders in Windows 10. Press “Win + E” shortcut keys on your keyboard to open Windows Explorer. Search and locate the file or folder you want to get full access. Right click on it and select “Properties” option. It will open a properties dialog box. Click on the “Security” tab and then click on the “Advanced” button. 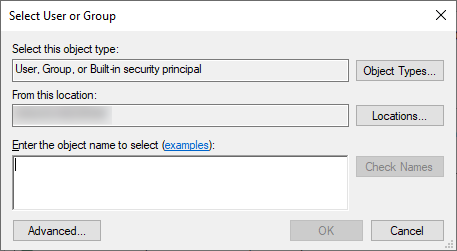 A new pop-up window will open called “Advanced Security Setting” where you can view the ownership of the file. In our example, the file is a system file. Hence it shows the owner as “System”. Click on “Change” link shown against the “Owner” field. And click on “Advanced” button at the bottom in “Select User or Group” dialog box. The next step is to find your user account. Click on the “Find Now” button and select your user account from the search result. Remember, the selected user account is the one you want to get ownership. Click “OK” and then click on the “Apply” button. Again, click on “OK” button on all the pop-up windows to complete the task. Now, you will get the ownership of the selected file or folder. Next step is to get the permissions to access the file or folder. Ensure the owner is showing as “Administrator” as shown below. After you get the ownership of that specific file, it’s time to get the required permissions to get full access over that file. Right-click on the file or folder you have got the ownership, and go to “Properties”. Click on the “Security” tab and thereafter, click on “Advanced” button. Under the “Permissions” tab, click on “Add” button. Click on “Select a Principal” link located against the “Principal” field. On the “Select User or Group” window, click on the “Find Now” button. From the search result, select your user account to which you want to get permissions, and click “OK”. 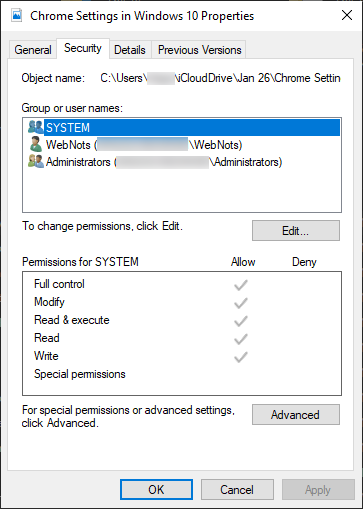 On the “Permission Entry” dialog box, select the permissions you want to get under “Basic permissions” section. Or simply check the “Full Control” option to get all the permissions. Click on “OK, and then click on “Apply” button. Again, click “OK” on the open dialog boxes to finish the task. Now, you have got all the permissions related to that file or folder have full access control. Remember, all files stored in the parent folder will have the same permissions as that of that folder. In case, you want to change the permissions for subordinate files, you can move over to the “Advanced Security Settings” of that specific file and make changes as explained above. Alternatively, click on the “Disable inheritance” button when you add your user name. If you are the owner of the file then you can change the permissions easily. Right click on the file or folder and go to “Properties”. 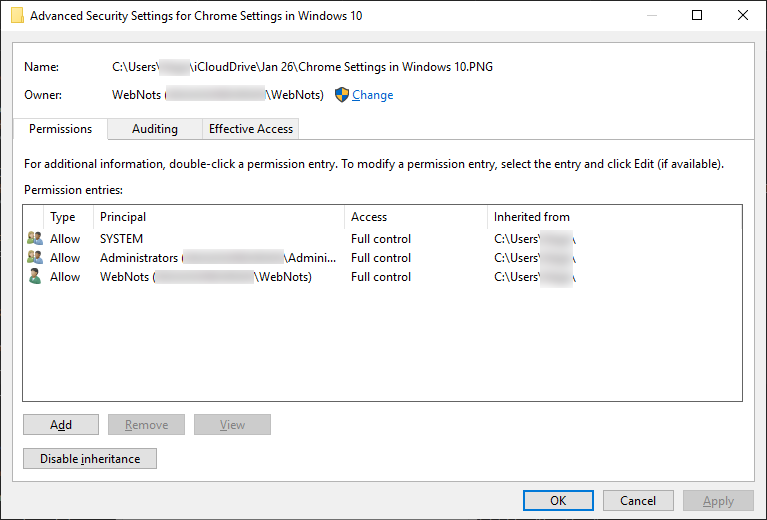 Navigate to “Security” tab and click on “Edit” button showing against “To change permissions, click Edit”. On the next screen, you can add or remove user and setup required permission for each user. Some of us setup “Read-only” or “Hidden” attributes under “General” tab of the file or folder’s “Properties”. However, any user can easily disable these attributes. So, setting up permissions is necessary to protect inappropriate access of your content. In addition, as an administrator you can take the ownership of the files and check the content if required.